One half of our daily chlorine exposure is from showering. Chlorine is not only absorbed through the skin, but also re-vaporized in the shower, inhaled into the lungs, and transferred directly into the blood system. In fact, the chlorine exposure from one shower is equal to an entire day’s amount of drinking the same water. When chlorine is used as a water treatment, it combines with organic matter to form compounds called trihalomethanes (THMs), also known as disinfectant byproducts. One of the most common THMs formed is chloroform, which is a known carcinogen. Other THMs formed include the di and trichloramines formed when chloramine is used as a disinfecting agent. These compounds are toxic when consumed, inhaled, or applied to the skin. 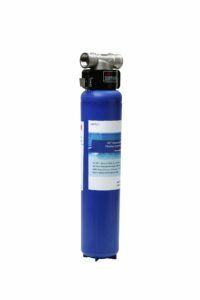 Whole house carbon filters are a great choice when considering a chlorine filter. Chlorine in various forms, is added to water by many treatment plants at levels that have been shown not to be a health concern. The goal is to kill bacteria and other harmful organisms but, unfortunately, chlorine itself can lead to an undesirable taste and odor, along with damaging side effects in your body. Improve the quality of all incoming water, providing cleaner, clearer water throughout your entire home. When you need to quickly and effectively treat all of the water that comes into your home, a whole house backwash filter may be your best option. These large water filters include a tank of filtering media through which water flows. The contaminants are trapped in the media, allowing clean, healthy water to flow through your home’s pipes. The filter bed itself is a granular substance that is usually referred to as the filter media. Media are numerous and varied. Common media are granular carbon, sand, garnet, anthracite, zeolite, granular manganese dioxide, and greensand. Many media are known by their brand names : Centaur, Filox, Birm, Filter Ag, and KDF, for example.